This layer represents trails which all permit bicycle travel or corridors with conversion potential; however, bicycles are not the exclusive travel mode permitted on these trails. This dataset, formerly named "Rail Trails," was created by the Massachusetts Department of Conservation and Recreation (formerly DEM - Dept. of Environmental Management) for the purpose of regional planning and mapping. In 2002 the layer was updated and renamed "Bicycle Trails". The linework in this layer represents trails which all permit bicycle travel or corridors with conversion potential; however, bicycles are not the exclusive travel mode permitted on these trails. The manager or owner of the trail should be contacted for detailed information about the permitted uses and rules of conduct that are specific to that trail. Most such corridors use, or connect to, old railway lines. The trails represented in this layer are open to bicycling as well as some combination of activities such as walking, jogging, roller blading, skiing, horse riding, snowmobiling, etc, though there are many other trails in the state that are considered multi-use but which are not included in this layer. At scales of 1:50,000 or smaller the data is reliable for all trails; At scales 1:50,000 and larger the data quality of some trails may be significantly inaccurate. This data set is stored as a single statewide layer in ArcSDE BIKETRAILS_ARC. The data was originally modified by DCR from the MassGIS Railroads Datalayer; it has since been modified for DCR by the University of Massachusetts in 1997, and updated by a citizen volunteer in 2002. Modifications were made using information from various paper maps, and much of the data came directly from USGS Topographic Quadrangles & MassGIS ortho imagery. TRAILNAME C / 40 The trail's name, as it is locally known. 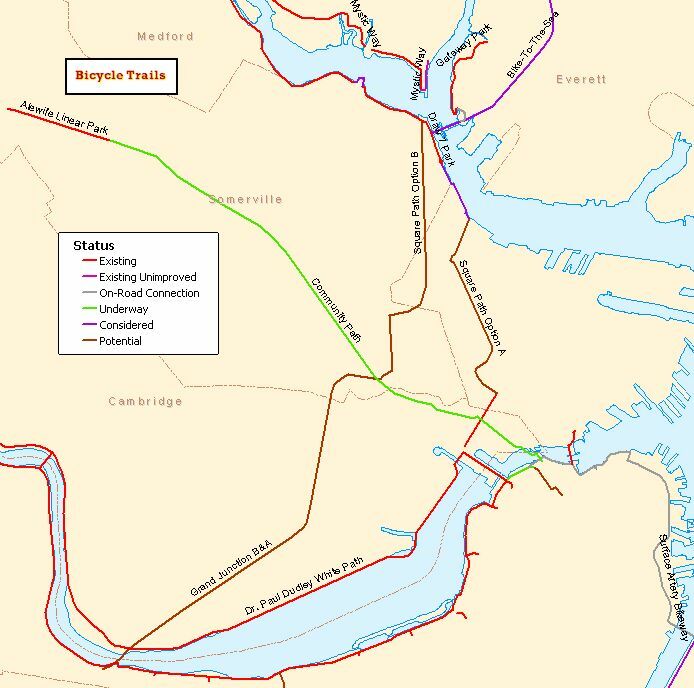 Larger routes which incorporate local trails (such as the East Coast Greenway) are not identified at this time. LINENAME C / 30 The name of the old rail line. If blank, this is not an old railroad. Canal and aqueduct trails will be identified in this field. C / 64 Website or contact information for citizen and government groups promoting or maintaining the trail. I / 9 Year of first official public use, and year in which last major segment completed. DCR and MassGIS are maintaining this datalayer. The data may be used in conjunction with the Long Distance Trails Datalayer, also produced by DCR. Current information on trail development is also maintained by the citizen group MassBike. The layer was modified in September, 2004, to incorporate new and updated linework and some attribute changes.